Edentulism, the loss of all of a person’s teeth, is more than an appearance problem. 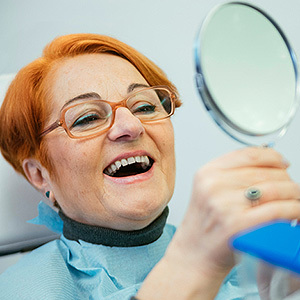 As one in four Americans over 65 can attest, total tooth loss can lead to emotional suffering, social embarrassment and a lack of nutrition caused by limited food choices. But there are solutions like the removable denture, an effective dental restoration for more than a century. In its current advanced form, the removable denture is truly a functional, affordable and attractive way to restore lost teeth. Creating an effective denture begins first by taking detailed impressions of a patient’s gum ridges. We use the measurements obtained from this process to create a plastic resin base colored to resemble the natural gums. Using old photos and other resources documenting how the patient looked with teeth, we choose the best size and shape of porcelain teeth and then position them onto the base. Finally, we fine-tune the dentures the first time they’re in the patient’s mouth to make sure they have a secure fit and a balanced bite when the jaws come together. We also want to be sure the dentures are attractive and blend well with other facial features. The result: a new set of teeth that can do the job of the old ones and look nearly as real and attractive. Dentures, though, do have one major drawback: they can’t stop bone loss, a common consequence of missing teeth. In fact, they may even accelerate bone loss due to the pressure they bring to bear on the gum ridges. Continuing bone loss could eventually cause their once secure fit to slacken, making them less functional and much more uncomfortable to wear. But a recent innovation could put the brakes on bone loss for a denture wearer. By incorporating small implants imbedded at various places along the gums, a denture with compatible fittings connects securely with the implants to support the denture rather than the gum ridges. This not only relieves pressure on the gums, but the titanium within the implants attracts bone cells and stimulates their growth. Thanks to this and other modern advances, dentures continue to be a solid choice for tooth replacement. Not only can they restore a lost smile, they can improve overall health and well-being too.